Temple of Amba Mata on Girnar Hill, near Junagadh. bl.uk > Online Gallery Home	> Online exhibitions	> Asia, Pacific and Africa Collections	> Temple of Amba Mata on Girnar Hill, near Junagadh. 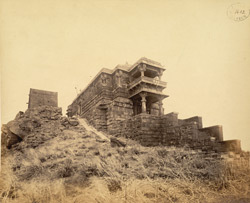 Photograph of the Ambhaji Temple at Girnar in Gujarat, from the Archaeological Survey of India, taken by D.H. Sykes around 1869. Mount Girnar rises more than 900 metres above the plain on the outskirts of Junagadh. The mountain is particularly sacred to the Jains but there are also Buddhist caves and several Hindu shrines. Inscriptions on a boulder with the edicts of the emperor Ashoka indicate that the site was an important pilgrimage centre since the 3rd century BC. Along the principal path that leads to the central peak of Mount Girnar, there are gateways, shrines and tanks. At a height of about 650 metres there is a group of sixteen Jain sanctuaries dedicated to Neminatha. These temples date from the Solanki period and later. This view shows the small ruined temple at the summit, dedicated Amba Mata or Ambika, a goddess associated with Neminatha.